As expected, last week at a Commonwealth of Independent States (CIS) leaders summit in the Kazakh resort town of Burabay, international terrorism and regional defense were core issues. Russian President Vladimir Putin warned of a spillover of violence from Afghanistan into the Central Asian region and floated creating a joint border task force with the other CIS members. 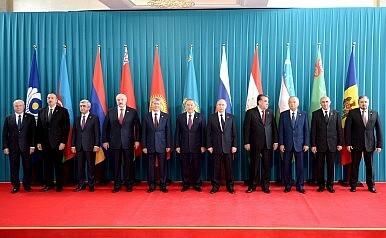 The October 16 meeting brought together the leaders of Armenia, Azerbaijan, Belarus, Kazakhstan, Kyrgyzstan, Russia, Tajikistan, and Uzbekistan to discuss a bevy of agreements and other procedural matters within the loose grouping of former Soviet states. Turkmenistan and Ukraine, which are not formal members of the group, sent observers. While some regional watchers worry that Central Asia’s authoritarian leaders hype the threat of ISIS incursions and Afghanistan spillover, using terrorism as pretext for crackdowns on opposition; Putin is fanning those fears. Moscow already has a significant military presence in Central Asia which it plans to expand. Russia’s leases on bases in Tajikistan and Kyrgyzstan were extended to 2042 and 2032 respectively, in 2013. The Russian force in Tajikistan, already the largest outside of Russia, is scheduled to grow to 9,000 troops (up from around 6,000) by 2020. Recently, it was reported that Moscow was sending a helicopter unit to the Ayni airbase. Putin’s remarks oversimplify the issue. There very well may be 5,000 Central Asians fighting in Syria and Iraq, but not all of them have joined ISIS. In a report commissioned by USAID, Registan’s Noah Tucker detailed the drivers of Central Asian participation in the conflicts in Iraq and Syria. While the whole report is worth reading, particularly important is the section where Tucker takes time to parse out which groups Central Asians are affiliated with and links these affiliations to the different narratives that drive individuals to joining a civil war worlds away from home. There are Central Asians on both “sides” of the Syrian civil war. But there remain weak spots on Putin’s coverage of Russia’s periphery–particularly along the Afghan border. Turkmenistan, with 744 km border with Afghanistan, is avowedly neutral. Ashgabat isn’t a member of any of Moscow’s various regional clubs–the CIS, the Eurasian Economic Union (EEU), the Collective Security Treaty Organization (CSTO), or the Shanghai Cooperation Organization (SCO). Uzbekistan, which is a member of the CIS, withdrew from the CSTO in 2012. In September, Karimov said Uzbekistan wouldn’t host any foreign militaries and wouldn’t get involved in foreign interventions. As if to underscore the point, it was announced last week that Germany would be vacating the airbase in Termez it has used as a staging ground for its participation in the NATO mission in Afghanistan since 2001.